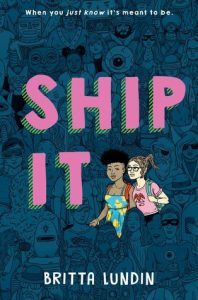 ‘Ship It’ is a fabulous YA novel about a girl obsessed with a TV show, who gets to live every fangirls dream- Meeting the actors of the show! Unfortunately, one of the lead actors is… Less than kind to her after she asks a question at a comicon panel about whether a ship between the two male leads will ever be canon. Throughout the story, it’s really entertaining to watch as Claire, the main character, spends time with the leads, publicists, and showrunner. It’s great to have a book that covers several generally ignored topics in fiction, such as queer baiting, lack of diversity, and, of course, coming out, both as something other than straight, and as a ‘nerd’. We get a story with supportive parents and entertaining characters… The fandom references are amazing. Britta did an amazing job creating an immersive story that invokes a variety of emotions, from laughter and glee to sadness and shock. And I have to say, I wish ‘DemonHeart’ was a real show, because I really want to watch it now!